The prevalence and incidence of dental diseases and its burden at Pan-Indian level remain largely unquantified and unreported. The available studies are locoregional or hospital based or too outdated in nature. In this regard, using mathematical model, Indian-level dental disease burden was estimated as a part of the global burden of diseases (GBD)-dental. However, the Indian-level data were not specifically discussed. The most recent India-specific GBD estimate also failed to project estimates of the dental diseases. Estimation of dental diseases and having its demographic characteristics would help the policy framers to frame adequate policies for oral health. Oral health workforce distribution in India is supposedly been skewed and would affect oral health-care delivery. Existing disparity in dental health-related economics specific to India, the data when available could form basis of India-specific public oral health policies., The aim of this communication is to address this lacunae and project the 2016 level India-specific dental disease data using the GBD approach and compare the same with the South Asian-level data. Secondary data analysis of primary data presented by Vos et al., 2016, was used for this study. Using the GBD data at https://vizhub. healthdata. org/gbd-compare/and http://ghdx. healthdata. org/gbd-results-tool, the data for permanent dental caries, periodontal diseases, and overall dental disorders for both genders (age standardized) at prevalence, incidence, and disability-adjusted life years (DALYs) were obtained. GBD uses a complex mathematical model and assumptions that have been previously described in detail elsewhere. Such approaches have been previously used successfully in other similar publications. Data were expressed as rates (per 100,000 population). Using the Bayesian disease modeling approach, the GBD visualization interactive function provided the estimates of the dental caries, periodontal diseases, and overall dental disorders. All definitions and scope used in GBD 2016 have been retained for this study purpose. The upper and lower limit of uncertainty interval as described in GBD 2016 has been retained. The values of the age standardized, incidence, prevalence, and DALYs of Indian males and females for caries of permanent teeth have been described in [Table 1]. For every 100,000 Indians, as compared to South Asian males (30903 in every 100,000), Indian males (31,489) had prevalence of dental caries. Among females, the same was 33,926 for South Asians and 34,426 for Indians. Similarly, the 2016 incidence of dental caries in 2016 was higher among Indians as compared to South Asians and more females suffered from dental caries than males. The DALYs of males and females for permanent caries teeth are described in [Table 1]. [Table 2] lists the periodontal diseases among age-standardized males and females of Indian and South Asian origin. It was observed that more rate (per 100,000) of Indian males and females suffered from periodontal disease as compared to the overall South Asian counterpart. The trends of incidence and prevalence reflected the same. Indians lost relatively more DALYs due to periodontal diseases than their other South Asian counterparts. [Figure 1] shows the DALYS rate and the prevalence rate of oral disorders (caries, periodontal diseases, edentulism, and other oral disorders) among Indian and South Asians. The difference between the genders and the populations show a clear difference. 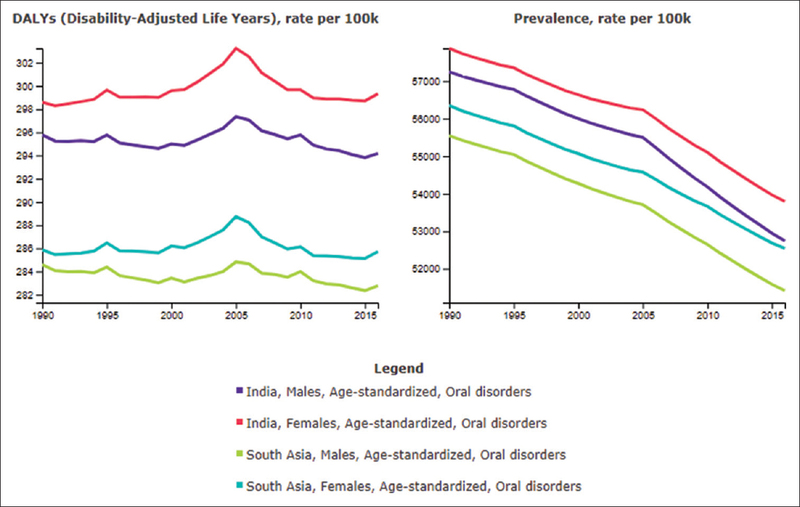 The oral disorder burden appears to slowly but steadily decrease from 1990 to present state across entire South Asia. Indian and South Asian females have more dental caries incidence and prevalence as compared to the males while periodontal diseases are lower among the females. There is a remarkable gender reversal between caries and periodontal diseases. This could be partly explained by the high use of substances such as tobacco and areca nut in these population as well as the oral dysbiosis due to systemic illness such as diabetes in these populations. Interestingly, more DALYs are caused by periodontal diseases rather than dental caries as the disability caused by dental caries is very limited. It is interesting to note in [Figure 1] that the DALYs were increasing from 1990 to 2005, after which, in the last 10 years, there has been a steady decrease to present state. This period is directly related to the rapid increase in dental workforce in India. The phenomenon needs to be studied in depth correlating the increase in dental workforce and its extent and reduction on the impact of oral health burden of diseases as measured by DALYS. As compared to global levels, the prevalence of oral maladies is relatively higher in South Asia and India, while there exists large degree of unmet health needs., The data presented herein are more convincing that incidence of permanent dental caries is more than 80 for every 100 Indians. Hence, oral dysbiosis and the influence of other systemic illness have to be considered on war footing. As prevention is the key to oral diseases, proper utilization of available dental workforce is the need of the hour. Dentistry per se is reported to move away from primary prevention of dental diseases to more cosmetic and esthetic concerns. Realignment of the primary focus and emphasis on the primary prevention of dental diseases are the need of the hour. The drawback of the GBD approach especially that of data representativeness needs to be included before a final conclusion is arrived. In addition, interpretation of the data needs to be done carefully as the primary data of this study is not from direct data collection but from mathematical modeling and locoregional variation in dental/oral diseases is not accounted. This short analysis indicates that Indian suffer more from dental diseases than their South Asian neighbors. More effective use of dental workforce is the need of the hour. Proper planning and implementation of the oral health policies would be helpful to mitigate the huge problem of oral maladies. The absence of intra-state variation in dental disorders as well as workforce distribution needs to be addressed before further oral health policy statements and action plans. Dandona L, Dandona R, Anil Kumar G, Shukla DK, Paul VK, Balakrishnan K; India State-level Disease Burden Initiative Collaborators, et al. Nations within a nation: Variations in epidemiological transition across the states of India, 1990–2016 in the Global Burden of Disease Study. Lancet 2017;390:2437-60. Balaji SM, Mathur VP. Dental practice, education and research in India. Oral health inequalities and health systems in Asia-Pacific. Nat India 2017. [Doi: 10.1038/nindia.2017.28]. Kassebaum NJ, Smith AGC, Bernabé E, Fleming TD, Reynolds AE, Vos T, et al. Global, regional, and national prevalence, incidence, and disability-adjusted life years for oral conditions for 195 countries, 1990-2015: A systematic analysis for the global burden of diseases, injuries, and risk factors. J Dent Res 2017;96:380-7. Righolt AJ, Jevdjevic M, Marcenes W, Listl S. Global-, regional-, and country-level economic impacts of dental diseases in 2015. J Dent Res 2018;97:501-7. Vos T, Abajoblr AA, Abate KH, Abbafati C, Abbas KM, Abd-Allah F; GBD 2016 Disease and Injury Incidence and Prevalence Collaborators, et al. Global, regional, and national incidence, prevalence, and years lived with disability for 328 diseases and injuries for 195 countries, 1990–2016: A systematic analysis for the Global Burden of Disease Study 2016. Lancet 2017;390;12111-59. Chatterjee P. The health system in India: The underserved majority. Lancet 2017;390:2426-7.